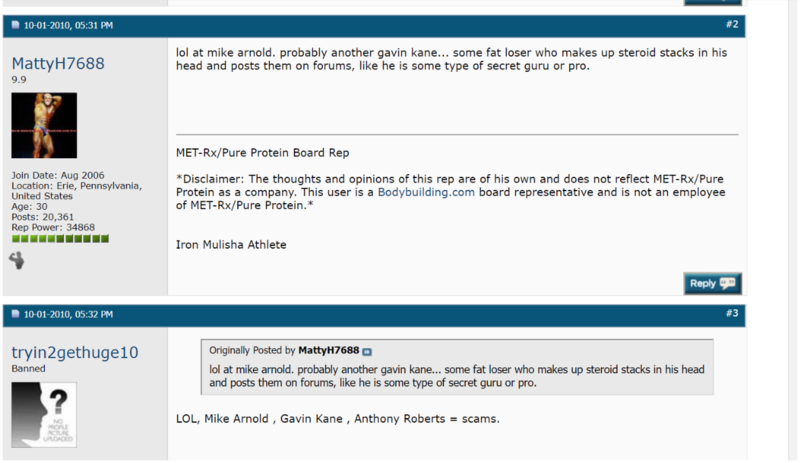 Once upon a time, the forums associated with sites like Muscular Development and Bodybuilding.com offered users everything they could have wanted: an opportunity to interact with top pro and amateur bodybuilders, a chance to share workout tips, a safe space to learn about anabolic drug use and the possibility of trolling and insulting every other user on the site. The posts were episodic, the rants were epic and the rivalries were enduring. You joined one or more of these forums, selecting some kind of made-up handle (“69UglyKidJoe420” or “IronPounderXXX”), and then went to war. These places, forgotten with the rise of social media and the resulting end of anonymity, weren’t so much marketplaces for ideas as battlefields on which a unique kind of subcultural identity coalesced. 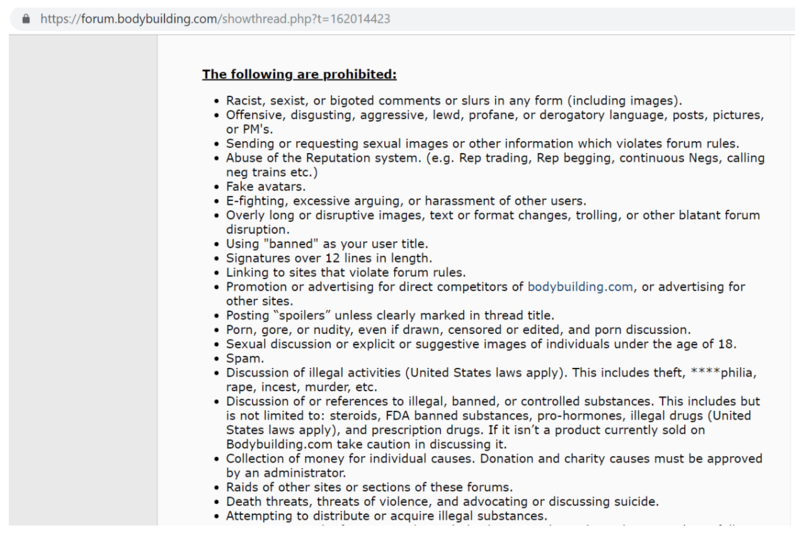 New and improved bodybuilding.com forum rules. During the rise of the “alt-right,” many articles attempting to trace the genealogy of the movement pointed to 4chan and 8chan (and related information repositories such as Encyclopedia Dramatica) as the furnaces in which all this rebellious, nihilistic, world-hating clay had been forged. The comedy website Something Awful, by contrast, launched the careers of plenty of so-called “dirtbag left” podcasters as well as “weird Twitter” figures like dril. The bodybuilding forums, however, covered a vast sort of middle ground, exemplified by my Grantland-reading, anabolic steroid-loving cousin Doug Alexander. Much of what Doug was reading happened to be the legacy of individuals like fitness journalist and author Anthony Roberts, one of several writers who pioneered anabolic research on the newsgroups of the 1990s that preceded the bodybuilding forums of the 2000s. Newsgroups were functionally similar to the later forums where many users migrated, but operated via usenet servers and newsreader software rather than a direct web-based interface. The newsgroups offered a convenient place to compile information and share contacts, but the number of users — like the number of internet users generally during the 1990s — remained small. It was only after the discussion migrated to web-based forums that participation, and especially trolling, increased dramatically. Getbig user discusses a hypothetical fight between ex-bodybuilder and convicted murderer Craig Titus and MMA fighter Phil Baroni. “I was one of the few people who began using his own name,” says Singerman. “Initially, I was on some of the sites under an anonymous handle, ‘AaronS889,’ but I realized I wanted to get my real name out there and make actual business connections in preparation for entering the supplement industry. But when some folks learned that my last name was Singerman, it didn’t take them long to start with the anti-semitic stuff. Singerman parlayed connections made on the forums into a multimillion-dollar business that now sponsors a number of athletes on social media, the method of communication and information dissemination that began supplanting the fitness forums in the mid-2010s. “Instagram is something completely different: You can read all these posts from fitness personalities, usually in the form of captions helping to promote one or more products, but the interactivity is gone, situations in which you could interact with notable people like Craig Titus and King Kamali,” he says. IFBB bodybuilder Cedric McMillan engages with the fans and talks about the boards in a 2011 post. But what, I wonder, were the long-term implications for forum users in terms of ideology and political engagement? Did they, like some 4chan and 8chan posters of today, find themselves drifting into the “alt-right?” Or is that perhaps the wrong type of question to ask? Oliver Bateman is a contributing writer to MEL Magazine. He writes about the extreme sides of fitness, the weirder sides of MMA and pro wrestling, and the unorthodox lifestyles of professional athletes. His writing on these topics has appeared in publications such as the Paris Review, the Atlantic, and the New Republic. Ever since he was a little kid, he's been really good at exercising.